I’m cheating this week- as I’m on a train to London to visit the RHS Hampton Court Flower Show. So I haven’t even got a jam jar with me. 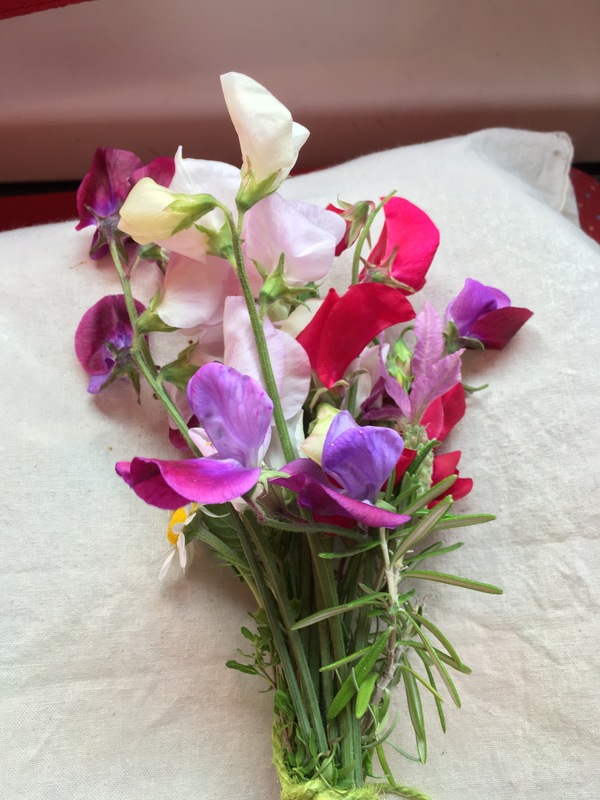 But, as always, I’ve picked a bunch of flowers from home to keep me company on my journey. There’s a comfort in a reminder from home. 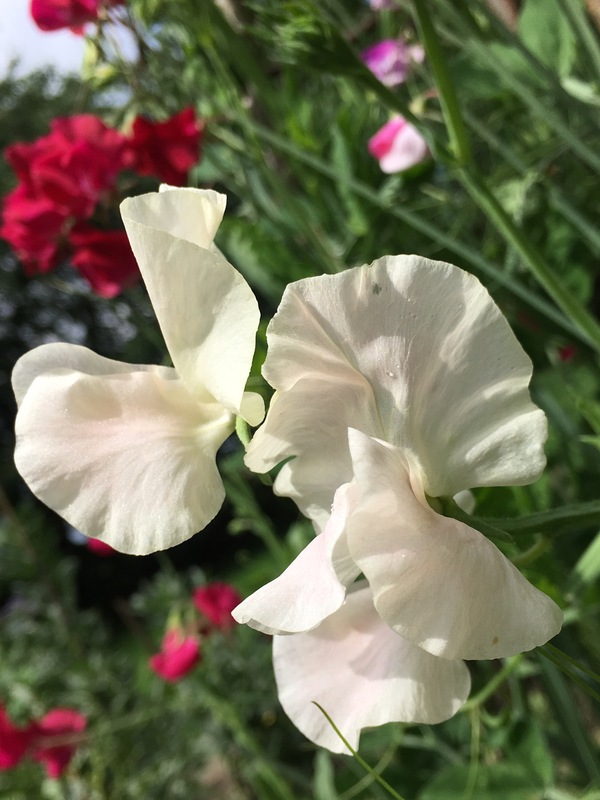 The scent of my sweetpeas is an antidote to diesel fumes and the ever -louder tannoy announcements. 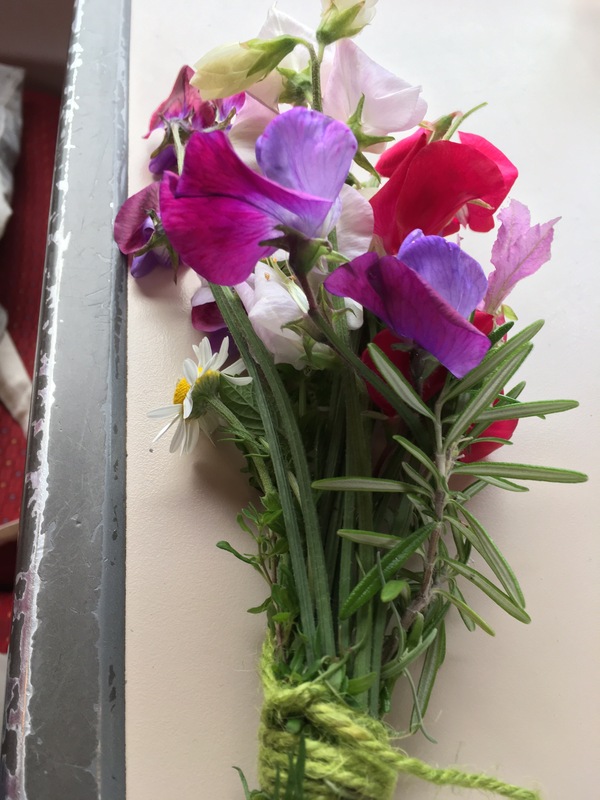 I enjoyed wandering around the veg plot at dawn picking these flowers. This year I’m growing a variety of new and heritage varieties. 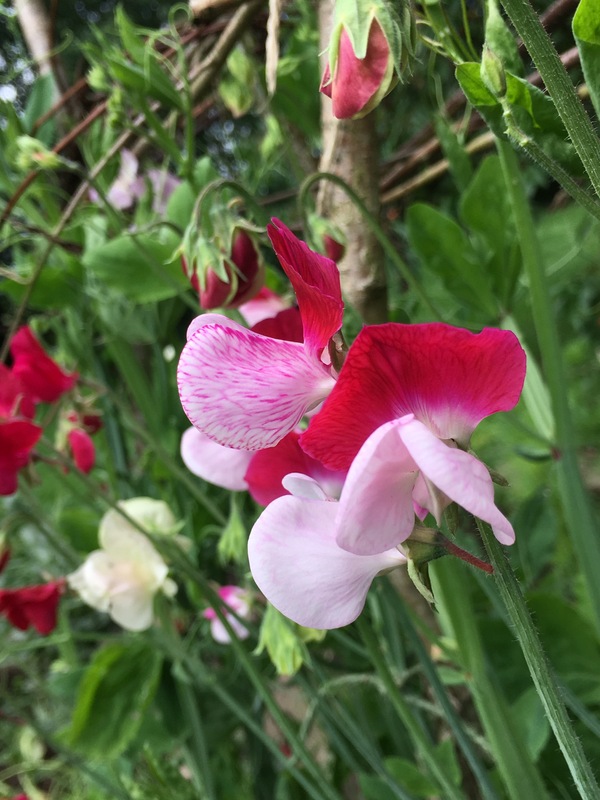 My favourites are High Scent, Albutt Blue and Mrs Collier white. I love the small flowered heirloom type. They seem to have the strongest scent. Here’s a slideshow from my garden this morning. 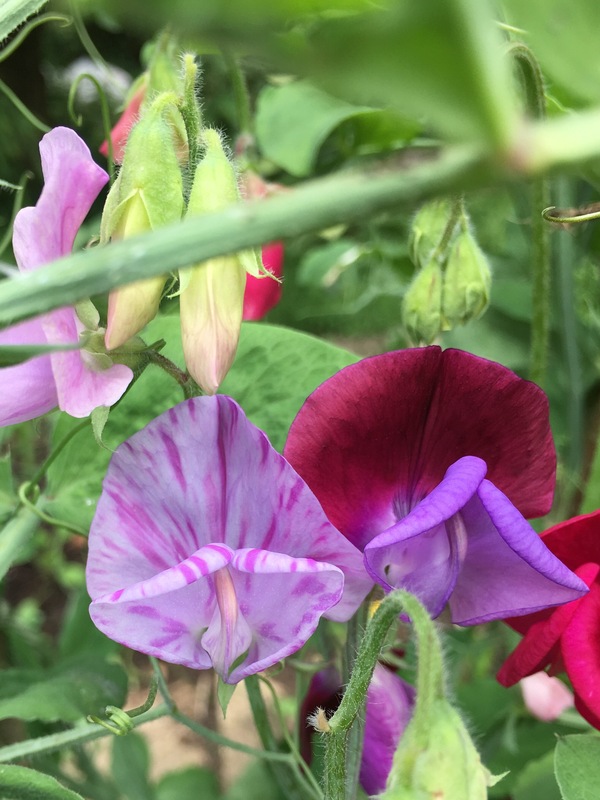 I wish you could smell the sweet peas. It’s the scent of summer. As always i’m grateful to Cathy from Rambling in the Garden for hosting this meme. 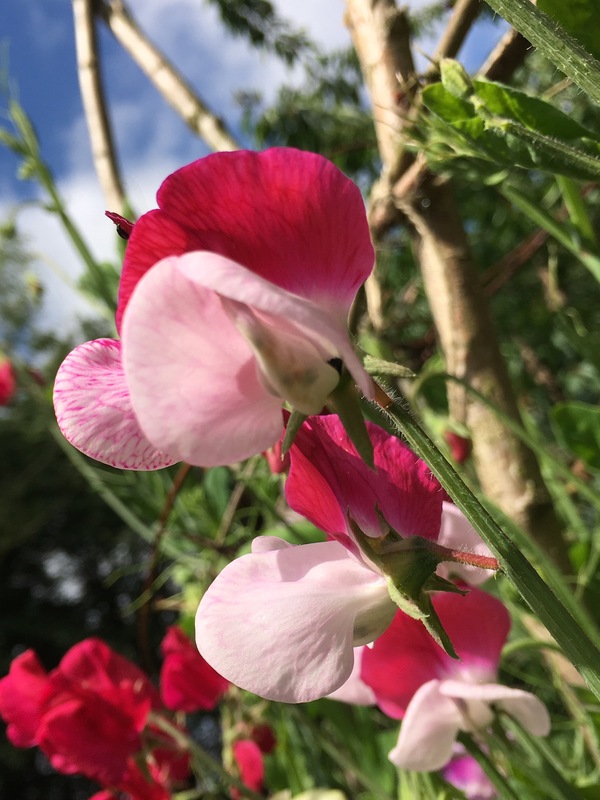 Go and have a look at what Cathy’s growing and showcasing in a Vase this week. Meanwhile…. 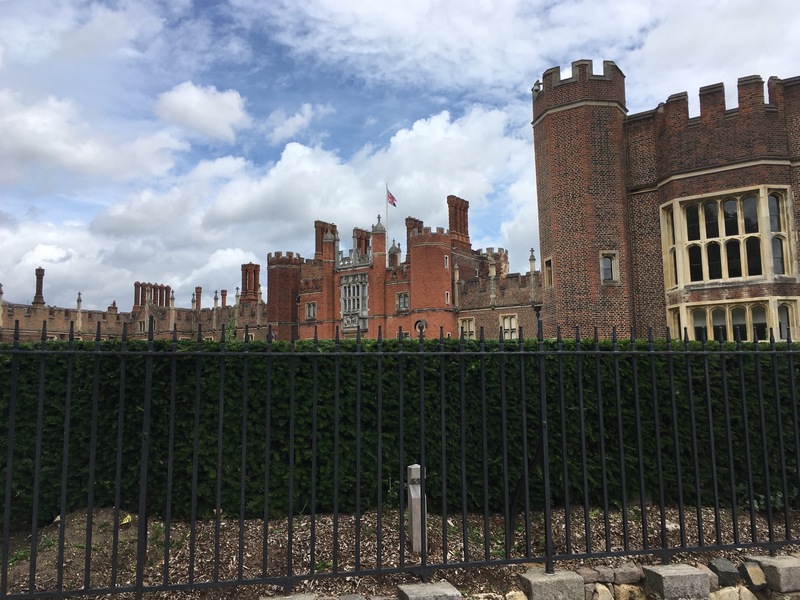 I’ve made it to Hampton Court. What a trek! ….here’s a taster of the gardens …..
← #wordlesswednesday- wild geraniums on the march. Your garden, photos, words and blog is so magical. I’m always carried away to another place when visiting. Thank you for such beauty. You’re so welcome! I would be laughing with you while driving aroud uploading haha. Looks like a great place to be! Love waking up to the beauty of your flowers! Hope you have a great day at Hampton Court FS! I feel a bit sad I’m missing the fun, as I’ve been lucky to attend three times previously. I love home, but Sometimes I think I’m living in the wrong country…at least May through September! Kathy lovely photos of your garden upon waking up in the morning. 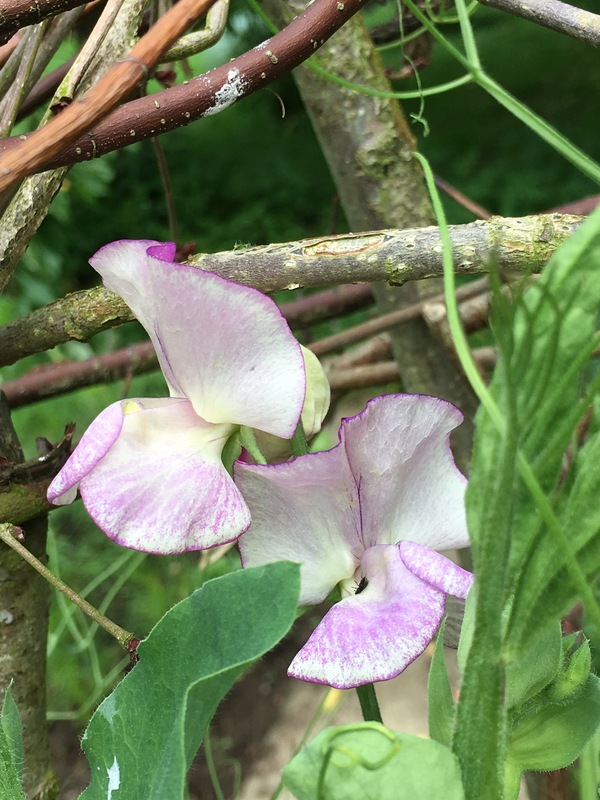 Sweetpeas are wonderful in all colors and should smell divinely. The bouquet of flowers tied is very beautiful, very field and beautiful fragrances. 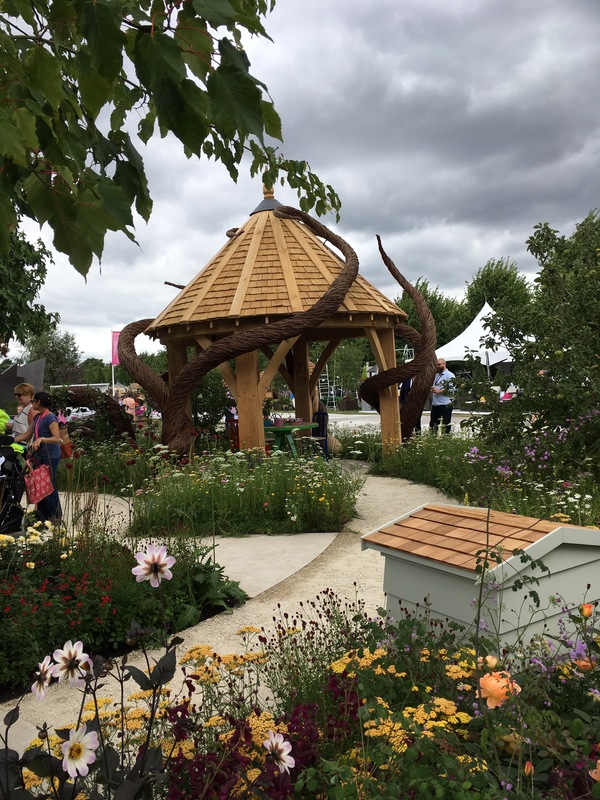 Thanks for the pics of Hampton Court RHS, I hope you had a great time walking the grounds. Greetings from Margarita. An old-fashioned nosegay – a perfect way to take a delightful bit of home with you! Not cheating at all, Karn – IAVOM does not have to be ‘in a vase’!!! 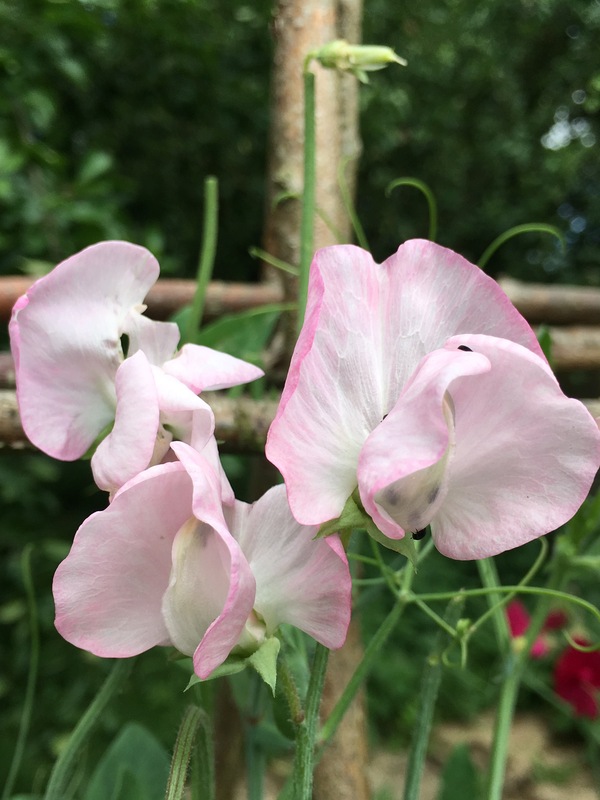 I think it’s a wonderful habit to have, whatever the reasons behind it.I especially like the pale sweet peas with colour on the petal edges – they always look so delicate. 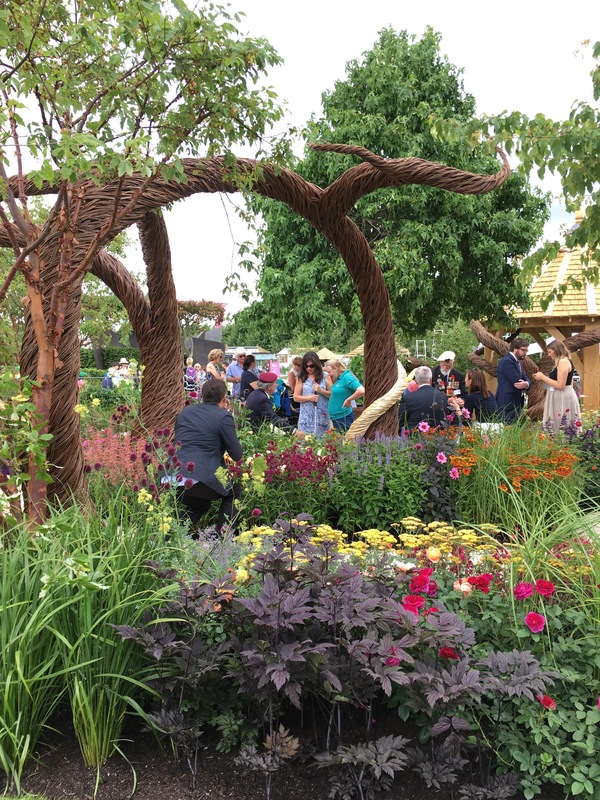 Glad you had a good day – I have heard several people suggest that Hampton Court is always the most enjoyable flower show to go to – would you agree? Yes, we’ve been once and it is a trek – but well worth it! It’s vast – and the views are amazing! I’m sure you’ll enjoy it! Have you been before? 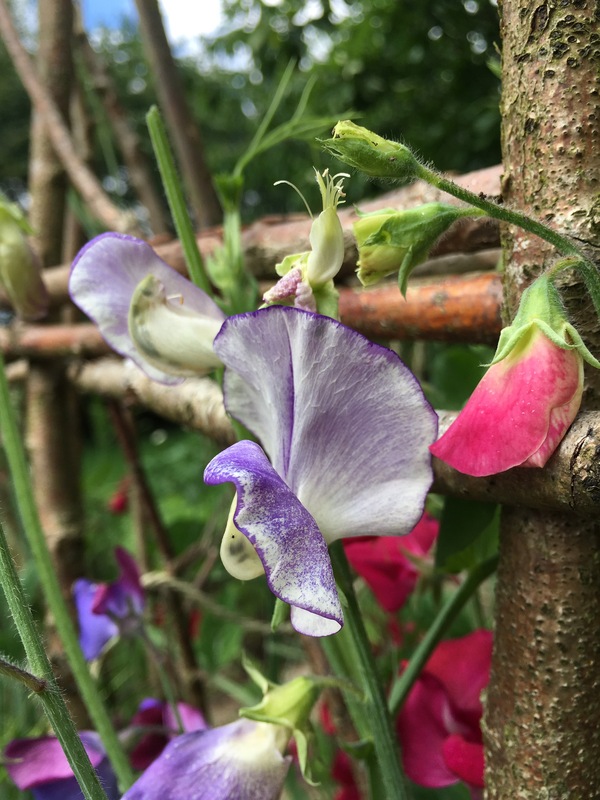 Your sweet peas are lovely! Nice idea to take a bunch for the journey! 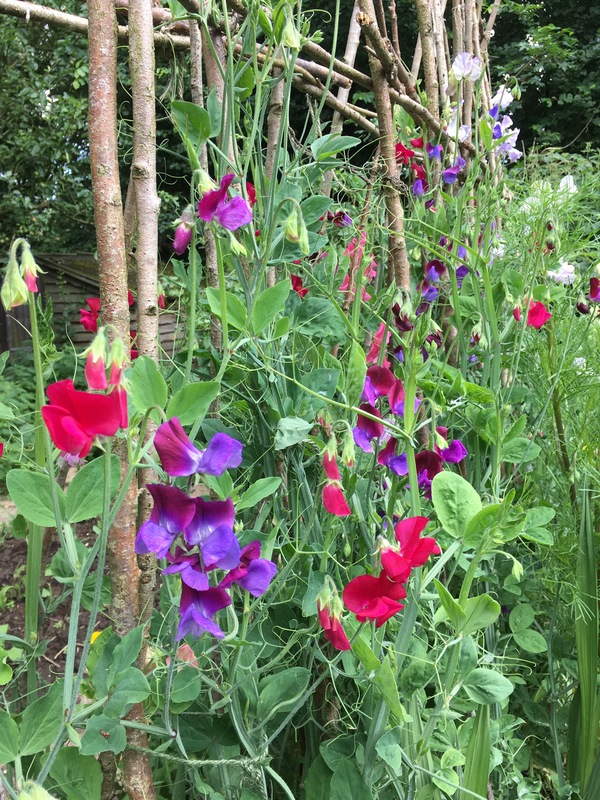 A beautiful selection of sweet peas, is ‘Cupani ‘ one of them?